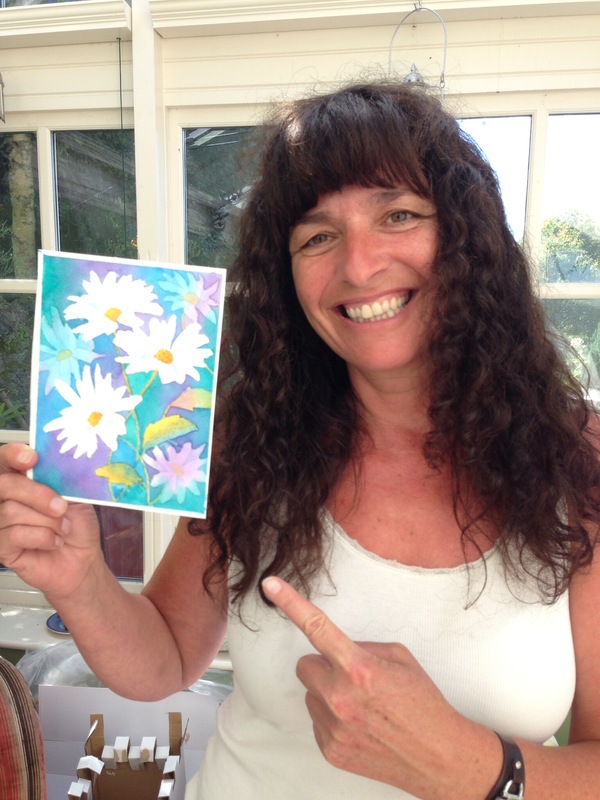 I was born and bred in south Devon and I have been painting and drawing for as long as I can remember, as a child all I wanted for Christmas was paint and paper. I studied fine art up to A Level at senior school under the tuition of eminent watercolourist Rob Dudley when I fell in love with watercolour. I absolutely love that it is unpredictable. I also took evening classes for a short time by way of protecting some painting time when my children were very small. 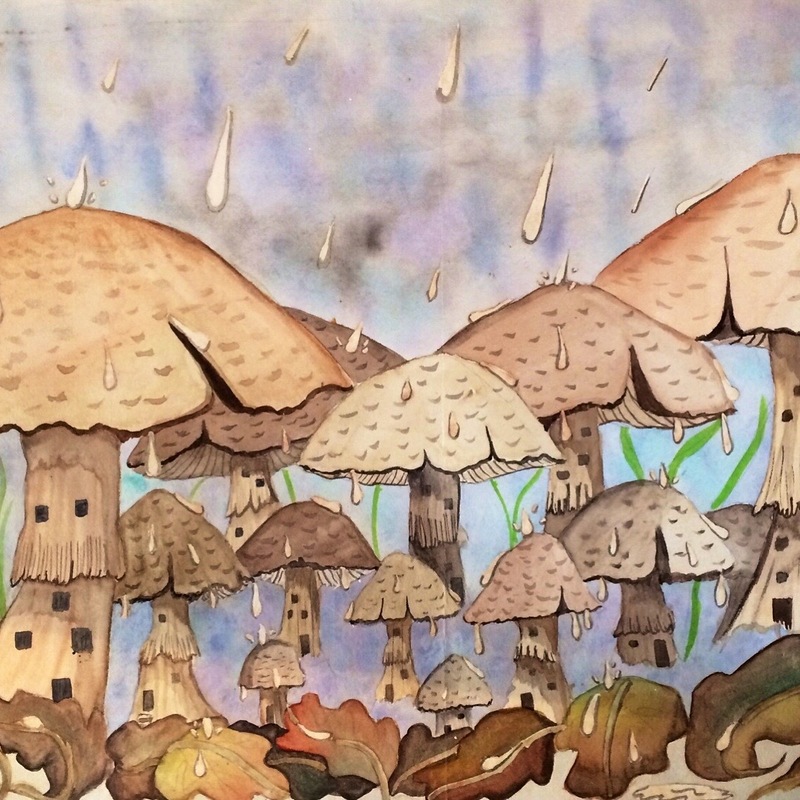 Here's a paintng by my 14 year old self, it's called Raintown, and I discovered things in this painting I didn't know I could do. I think being interested in art is something I am made to do...I just am. I can't not. I remember being at nursery school, aged 4 or 5 and I was painting at an easel totally absorbed in the feel of the poster paint slurping and sliding around the paper adding colour and marks to what seemed to be a painting alive. I became cross however, when the colours began to muddy and merge which didn't express my feelings at all so I scrubbed at the paper and covered over what I had been painting. It must have been a funny sight this little girl lost in her painting world and then ruining all the hard work. It was something I needed to do...and continue to now. 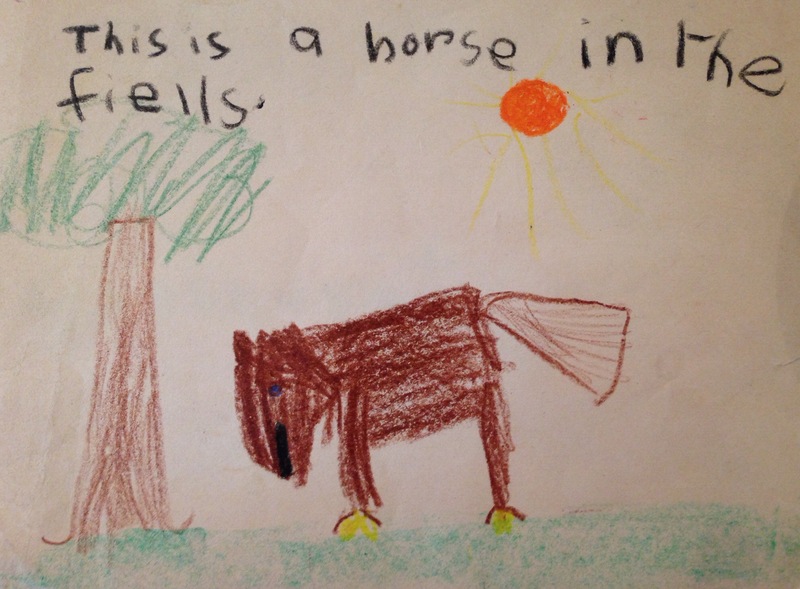 This is a crayon drawing I made about the age of 6. 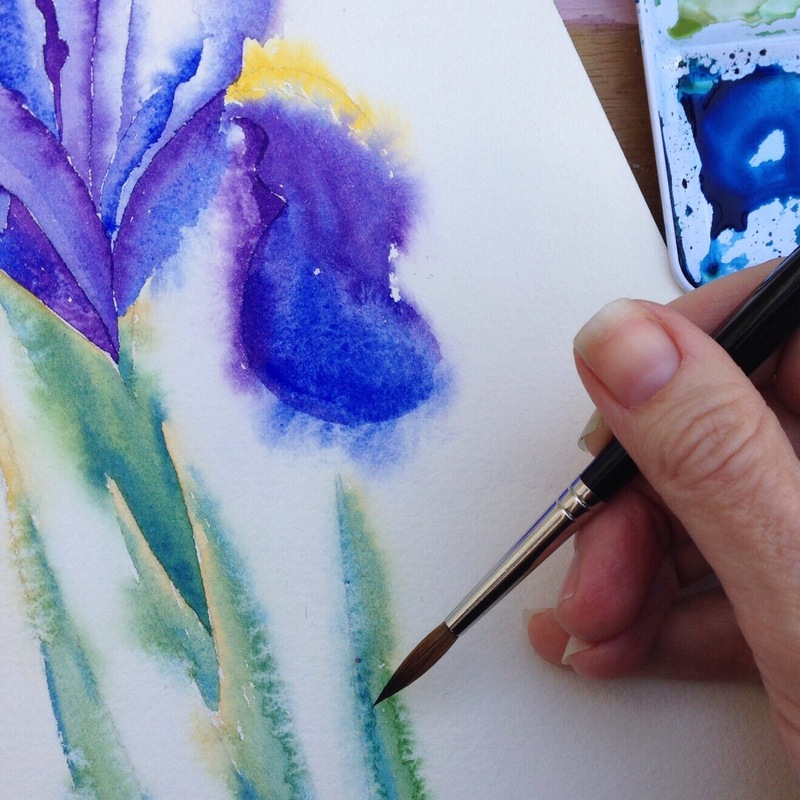 You mention on one of your online profiles that you also tutor small groups and individuals on watercolour technique. Please tell us a little bit more about that. Where do you organize those classes? One of my favourite parts of my job is tutoring and sharing watercolour technique. My students are without exception eager to learn and I am honoured that they consider me to be a role model. I teach mostly at my home in South Devon, I am enormously lucky to have a large conservatory that affords amazing light and plenty of space for my students to spread out. I keep the group numbers small, a maximum of three at at time, so I can give them the attention they deserve. I also demonstrate at painting groups which is always fun and more informally at art shows and galleries. 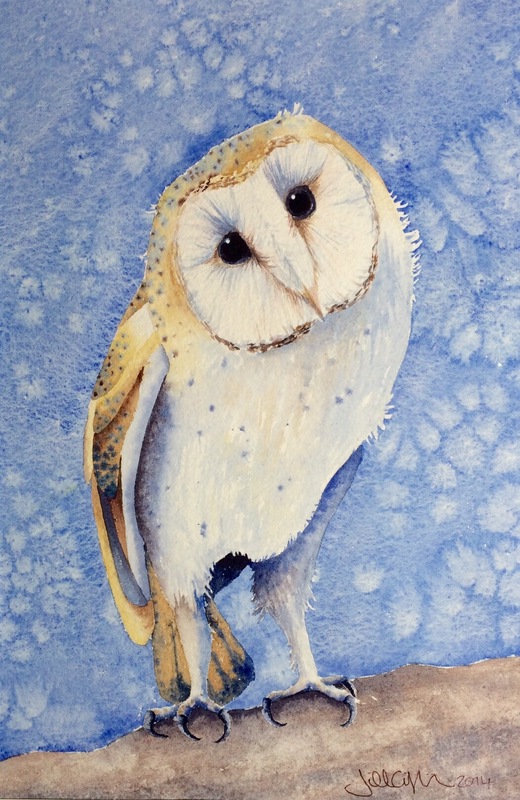 Sharing is absolutly fundemental to me as a person and to be able to do this in a variety of worthwhile ways is wonderful and I am an ambassador for St Cuthberts Mill watercolour papers which is a thrill for me to be able to share my favourite papers on their behalf. You mention on your WonderStreet profile that you live and work in Devon. 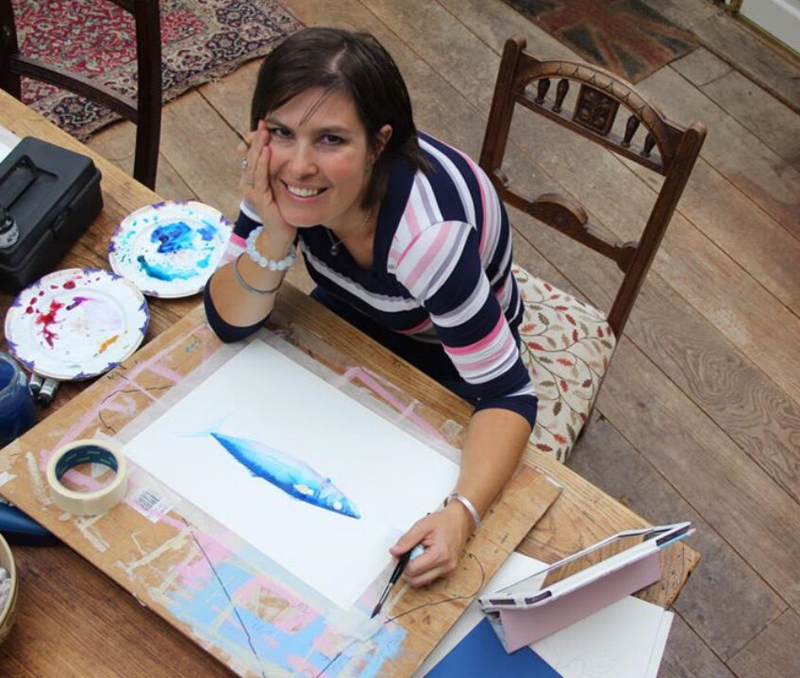 What advice would you give to artists considering a move to Devon? Devon is a wonderfully inspiring county for artists, particularly those who are moved to draw inspiration from the natural world. Devon is blessed with two, very different, coastlines, rocky moorland, rolling hills and wonderful woodlands. While Cornwall enjoys an excellent reputation in the art circles, Devon has made amazing strides over the last few years with investment and opportunity in the arts. My biggest piece of advice would be to seek out fellow and collaborative artists to share support networks and cross promote. Working together artists can make lasting impressions in the art community and beyond. I am in awe of Van Gough, for the real-ness in his work, particularly the cherry blossom works and the capturing of every day landscapes. I adore Rodin's sculpture, my favourite of all being Eternal Spring, there is something about that work that conveys being utterly lost in the passion of the moment. 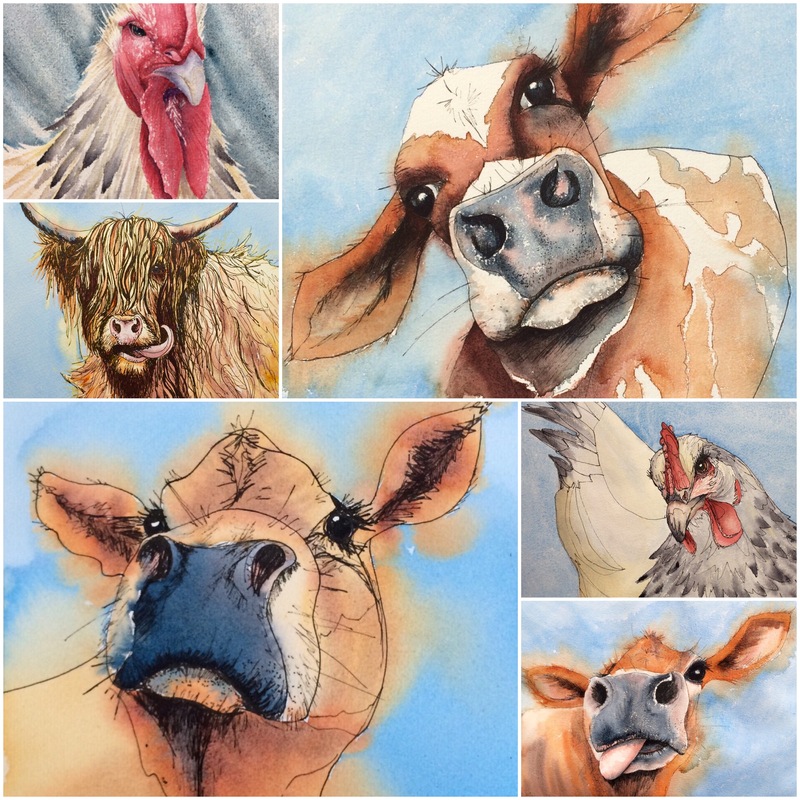 There are also current artists who's work I admire - Karen Whitworth's capturing of light; Jeans Haines' expression of movement in such fluid watercolour; Kelly Eddington's unparalleled realism in watercolour. All amazing, and all practicing technique at a level that I aspire to achieve. That's easy! Watercolour. I have tried others, but watercolour must run through my veins as I cannot get enough. I love that it is transparent, in the most part, and one can layer colour on top of colour and bleed and merge colours on the paper.The fluidity and unpredictability of this medium means it's variety is endless and it refuses to bend to the will of the artist. We can direct and tease watercolour into what we want it to be but ultimately it has a will of its own. Depending on all sorts of things, atmospheric conditions, the type of paper, the loading of the brush, the concentration of pigment in the water, the chemical nature of the pigment-There is so very much to learn. When I think of how far I've travelled in the 35 years, (or more!) that's I've been painting, I am so exited for what I'm going to be doing next! For all those unpainted compositions yet to come. That's rather like asking if I have a favourite child! Curious Charlie is probably a notable work for me, he has not won any prizes but he taught me so much about painting animals and fuelled my love for capturing animal expressions. I wonder some times whether I'm a channel for their personality when painting creatures or whether they are a channel for mine! Charlie will always have a special place in my heart- he now lives in the Patreon.com offices in SanFransico and one day I hope to visit him there. 2016 has three exciting shows for me, aside from the local galleries that represent me. The first is at RHS Rosemoor in May 2016:a Royal Horticultural Society garden with lots of lovely colour to inspire. I then have a residency with a Rembrandt at Buckland Abbey in June and July, which is a particularly exciting project where I will be painting at the Abbey and exhibiting my work with colleagues from DevonArtPop alongside a genuine Rembrandt self portrait. Then I finish the season off with an Autumn colour inspired exhibition at NT Killerton House, again with my DAP colleagues. You are also very much involved in Devon Art Pop, a pop-up art gallery. 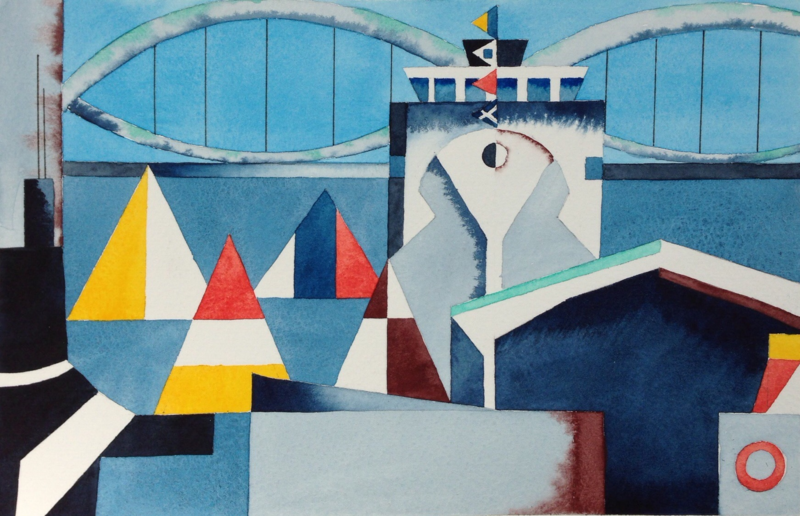 Can you tell us a bit more about Devon Art Pop and your role in this pop-up gallery? 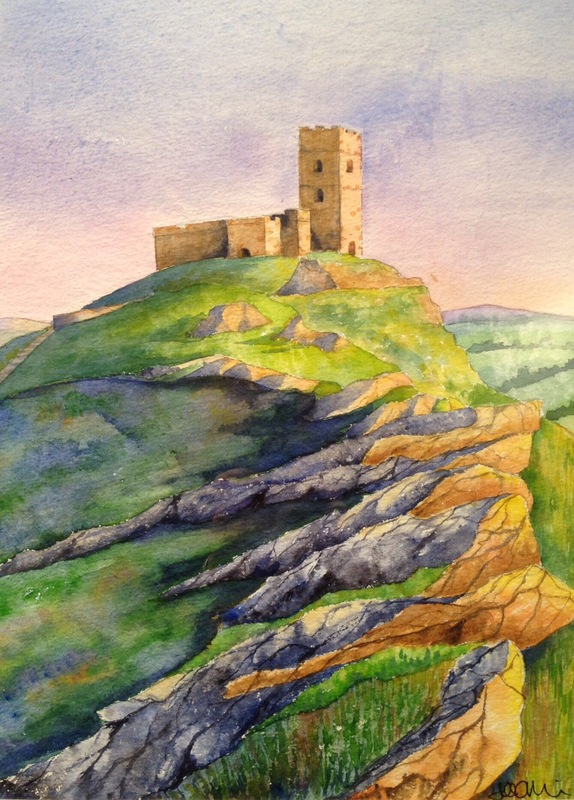 Devon Art Pop is a group of artists working together to put on art shows around our home county- Devon. We started by chatting on social media and I was listening to a young graduate complain about lack of opportunities to exhibit, so I thought why don't we make things happen for ourselves. So we had a call for artists and a venue to host us, sourced some display stands that were being given away and held our very first show in September 2013 which was a roaring success. I am one of the main co-ordinators and proud to say a founding member. October on Greenwich, is my favourite work of Autumn 2015. 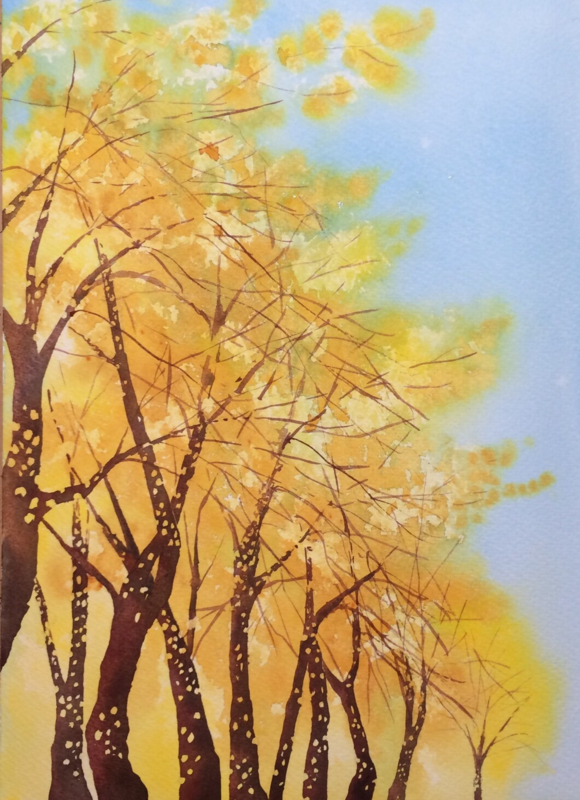 It gives me wonderful memories of a few days in London with my family and the colour of the Plane trees against the sky with the dark trunks contrasting the leaves. I love it. 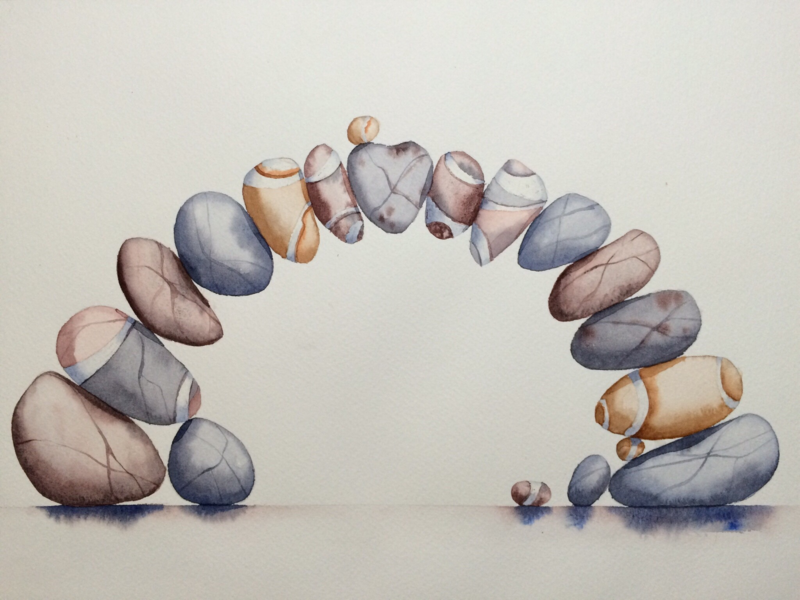 Impossipebble Bridge, was such a fun composition. I adore pebbles and like to arrange them in interesting shapes and stacks. I was amused when someone asked me how on earth I managed to get them to stay like this...my reply was Artistsic License! 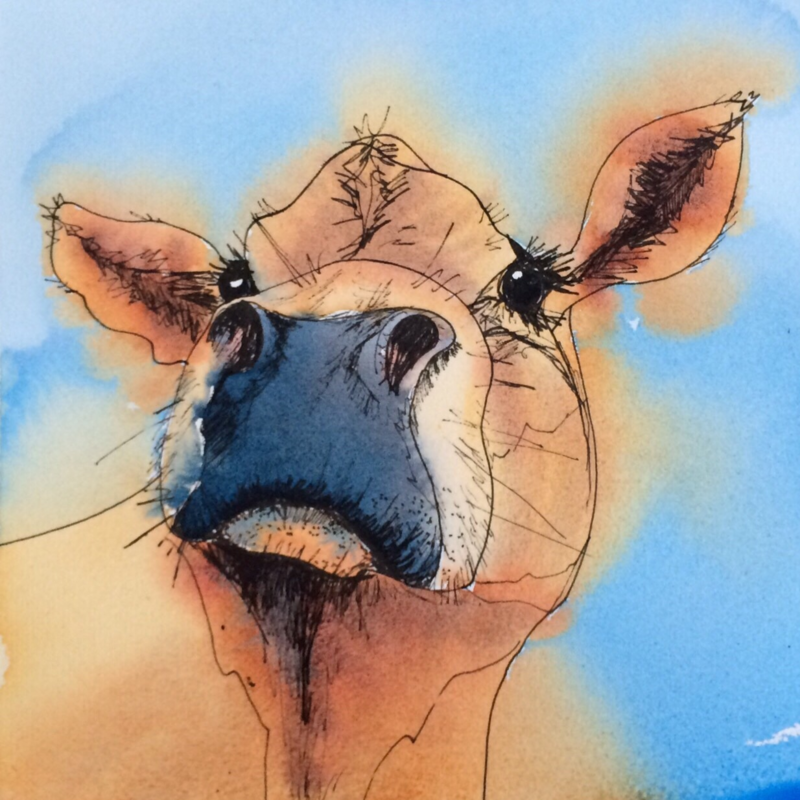 Hyacinth- she was my first cow painting, made from a sketch in my little sketchbook with a single line that raised a lot of interest. She feels like a old friend as she is so very familiar to me and was incredibly popular. 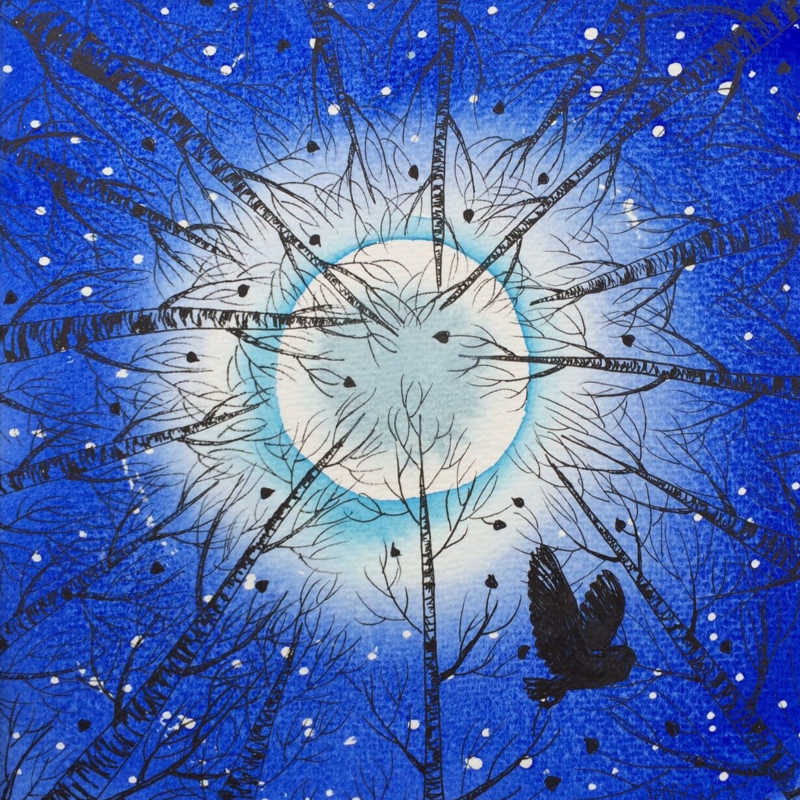 After Dark- this is the last painting in my Plymbridge Birches series, inspired by wonderful moonlit walks in the forest. I have never actually seen an owl in the wild flying between branches but that doesn't mean I can't in my imagination. 61- this was a real landmark piece for me. 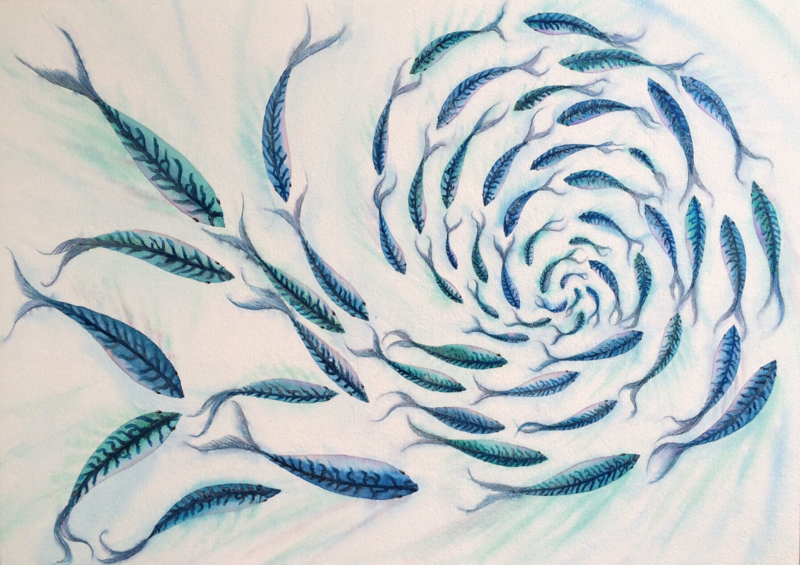 It was 8 months in the making and has 61 fish, spiralling and circling around and around. I am pleased by the number of fish, 61 being a prime number, that seemed important to me. It also included iridescent pigments that caught the light and added a whole new dimension to the work. Sleek Black- this is a work that is close to home, featuring landmarks local to Plymouth, including a submarine! It was part of a small series of abstracted townscapes and this one has a secret message hidden in the flags flying from the war ship. It says 'I want to communicate with you SBM' Sleek Black Messenger (of death) is Royal Navy parlance for submarine. Snape- I love birds of the corvid family-, crows, rooks, Ravens etc- their plumage is not really black but shimmers with blues, greens and purples as their feathers reflect the light and they are such smart birds. 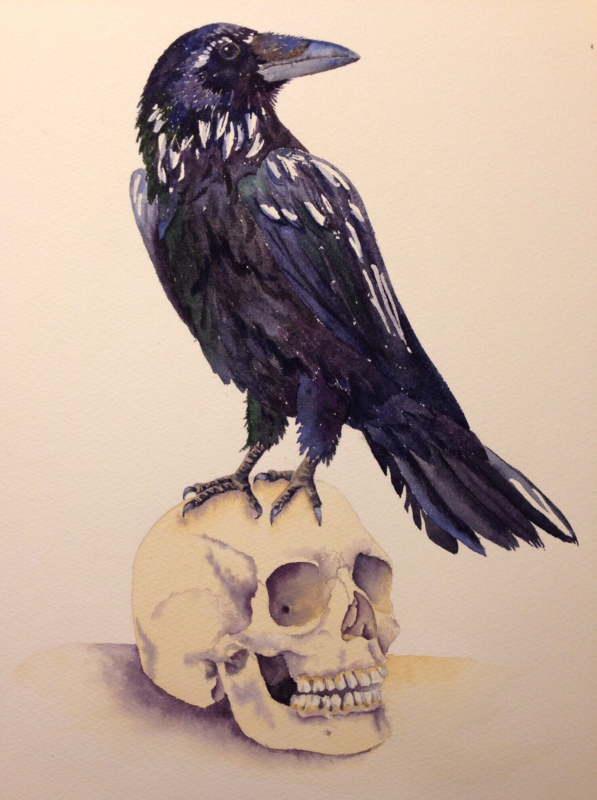 Sometimes associated with death, I've chosen to paint Shape sat atop a skull called Poe. If anyone can guess the link I would be impressed! I rather like bones, and skulls in particular- showing my dark side I guess! Thank you Jill for offering your interesting and inspiring views!